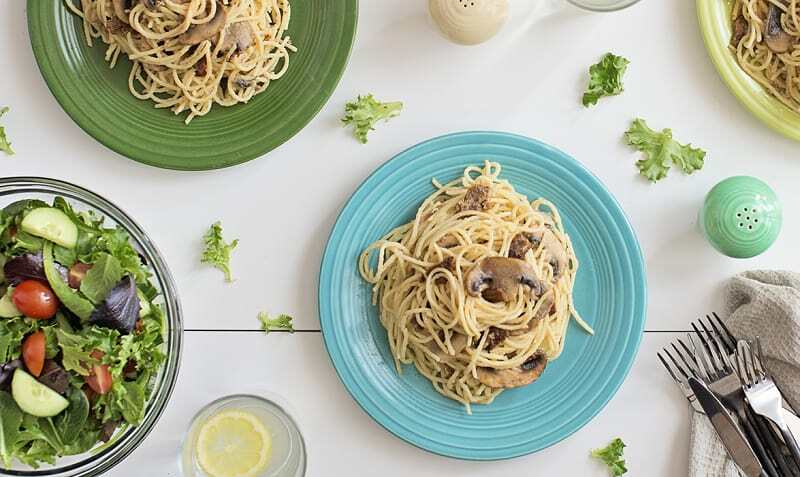 Cauliflower blends into a delicious creamy sauce, and combined with spaghetti noodles, savoury vegan bacon and hearty mushrooms, this comfort food meal is packed with veggie goodness. Served with a fresh side salad. Best prepared within two days of delivery. Defrost the cauliflower by steaming it or using the microwave. Put a large pot of water to boil for the pasta. Mince the garlic, wash and slice the mushrooms. Pan fry the garlic, mushrooms and Fake-O-Baco bits with a dash of oil in a large pan for 5 minutes over a medium heat. Remove from heat and set aside. Chop the cucumber and cherry tomatoes for the salad. Add them and the greens to a large serving bowl. Add pasta to boiling water and cook to package instructions. 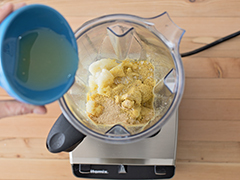 Add the cauliflower, 3 tbsp olive oil, spice mix, salt and pepper (to taste), and the juice from 1 lemon to the blender and blend until smooth. 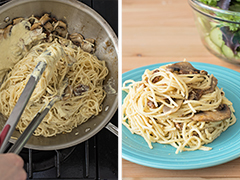 Use up to ½ cup of water, as necessary, to create a creamy sauce. When pasta is cooked, drain it in a colander. 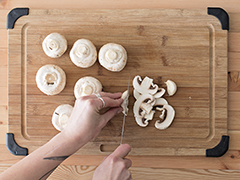 Remove about a ¼ cup of the mushroom mixture from the pan. This will go on top of the pasta when plating. Add the pasta and pasta sauce into the pan with the mushrooms and mix well. Warm up on med/low heat briefly, if necessary. Plate your pasta on four plates, topping with the reserved mushroom mix. 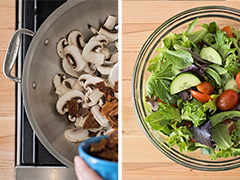 Toss your salad in a large bowl with a dressing of your choice.